When you stay at Grande Shores Ocean Resorts Condominiums in Myrtle Beach, you'll be on the beach, within a 15-minute drive of Ripley's Aquarium and Broadway at the Beach. 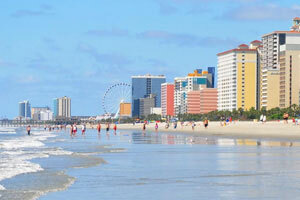 This beach hotel is 5.7 mi (9.1 km) from SkyWheel Myrtle Beach and 6.5 mi (10.5 km) from Barefoot Landing. Make yourself at home in one of the 200 air-conditioned rooms featuring kitchens with full-sized refrigerators/freezers and ovens. Your bed comes with premium bedding, and all rooms are furnished with double sofa beds. Rooms have private furnished balconies. Wired and wireless Internet access is complimentary, while 27-inch flat-screen televisions with cable programming provide entertainment. Dip into one of the 2 outdoor swimming pools or 5 spa tubs and enjoy other recreational amenities, which include a lazy river. Additional features at this hotel include complimentary wireless Internet access, a television in a common area, and tour/ticket assistance. Satisfy your appetite for lunch or dinner at Shoreline Cafe, a restaurant which specializes in American cuisine, or stay in and take advantage of the room service (during limited hours). Unwind at the end of the day with a drink at the bar/lounge or the poolside bar. Buffet breakfasts are available daily from 6 AM to 10 AM for a fee. Featured amenities include complimentary wired Internet access, a 24-hour business center, and a 24-hour front desk. Planning an event in Myrtle Beach? This hotel has facilities measuring 1581 square feet (147 square meters), including conference space. Free self parking is available onsite. The preferred airport for Grande Shores Ocean Resorts Condominiums is Myrtle Beach, SC (MYR). The credit card being used as the method of payment must be presented at check-in at the property. Should the cardholder not be present at check-in, the hotel must have a photocopy of the credit card and an authorization form on file from the cardholder prior to check-in. For more details, please contact the property using the information on the reservation confirmation received after booking.